Discount coupon is one of the most common marketing tools. With PayDollar eVoucher Solution, merchants can now conveniently set-up coupon campaign by a few steps. 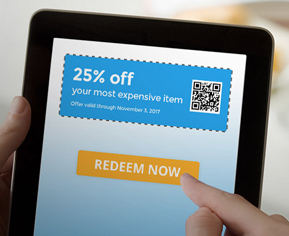 The system supports both electronic and print coupons for customers to redeem online and offline. Its advanced reporting function provides detailed coupon usage and transaction tracking reports that makes post campaign review feasible and easy to manage.